Decoding the DNA of the Toyota Production System. Spear and Bowen, 1999. “The specialisation and standardisation of work …. lead to more handovers, fragmentation of the work, duplication and rework that more than cancel out any gain”. Lean is a Wicked Disease. How Service Organisations are Waking Up to the Problem. Seddon, 2010. As a Lean Thinker the world can seem pretty confusing at times! It is our job to both study and learn from the past but also to challenge the now, so that we can improve tomorrow. The previous two quotes highlight the predicament that many of us face. I highly respect the work of Steven Spear, H. Kent Bowen and John Seddon, who have all greatly contributed to my understanding of what it means for an organisation to pursue perfection, but who is right? And why must there be a fight?! What inevitably happens as part of these discussions is the development of a spiderweb diagram. This map illustrates how all of the different elements feed each other, and evolve from each other and all coexist together. I consider the development of standards to be a critical ingredient within this web. The diagram above is my attempt to ‘tidy up’ my thoughts in this area. It isn’t perfect, it doesn’t comprise of all of the necessary elements needed within a lean enterprise, but it does help teams to see how many of the key concepts knit together. Arrows indicate some kind of relationship between the different elements. The relationship indicated could suggest that one activity needs to happen before its related entity can exist, or that that element will contribute to the success of its related element. So let’s start to unravel the web, and to extract the role that standards play in the success of a continuous improvement approach. But what should the standard look like? Well that’s why I’ve linked the standard box to the important principle of making work visual (3). The best standards are simple, clear and easy to understand (4). They shouldn’t be overly complicated or prevent workers from being able to think. Especially in service. John Seddon is right to criticise the development of overly specified standards which attempt to turn workers into robots. We have all experienced the pain of being on the receiving end of a call centre script or the inflexibility of a customer service interaction where your reasonable request is quashed by the ‘it’s company policy’ line. What I think is key is to understand the ‘granularity’ of the standard that is required and that different situations will require a different degree of detail. Of course, the development of standards goes wrong, regardless of the degree of granularity of standard that is pursued, when they are not truly developed by the people for the people. 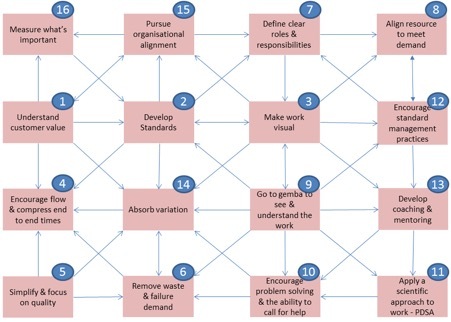 Standards must be developed where the work happens, at the gemba (9), in order to be relevant and useful. Therefore, it is also these people who will be able to decide the level of detail that is required within the standard (i.e. where the standard needs to fall on the standardisation spectrum). If the standards are developed for the people, by the people, they will also be much more likely to use the standard as a basis for improvement, searching for new ways of working, thanks to the visibility and clarity that a well developed standard can provide. The fact that standards provide the basis for problem solving (10) and provide organisations with the opportunity to apply a scientific approach to the world of work (11) is very well documented and discussed. When coupled with the guaranteed reflective time and space that standard management practices (12) provide, standards provide leaders with a fantastic opportunity to coach and mentor (13) their staff to reflect on their working practices with a view to improve them. So if the standards that are developed are simple, active and helpful, they should be able to give employees the clarity and confidence to be able to do as Seddon discusses, to absorb variation (14). The best way to absorb this variation, I think, is to be sympathetic to the plight of the customer who has requested a service from you, or as Seddon advocates, to understand the purpose of why you are there! It is therefore critical for the organisation to be aligned to this understanding (15) and for the standards that are developed to be aligned to this mission. All of these wonderful things can be achieved, as long as you don’t take the concept of developing standards to the nth degree if it’s not necessary, and that’s why understanding where the approach needs to sit on the standardisation spectrum is so important. So I believe that both Seddon and Spear and Bowen are correct to some extent, but that what is required, as ever, is a very sensitive approach to the application of continuous improvement concepts in different environments, particularly within the world of service. I believe that by better understanding how the different constituent elements of a lean enterprise knit together, change agents can better work with teams to flex the improvement approach needed in order to make a difference. Standards in service must be respected as one of the lean enterprise’s critical keystones however. It’s just essential to be able to adapt the granularity of that standard and to appreciate that a 5 point checklist, if that’s all that’s required in order to increase quality, increase process visibility and therefore customer confidence, is an excellent contribution in terms of helping to achieve improvement.